Audi sees potential for just one diesel model in U.S. 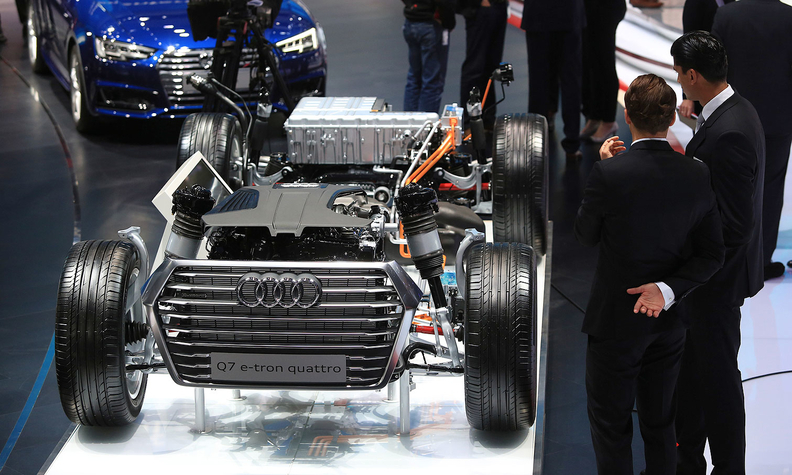 The chassis of an Audi Q7 Quattro e-tron at the Frankfurt auto show in Sept. 2015. Audi's top U.S. executive says the future for the brand is electrification, rather than diesel, with EVs projected to make up 25 percent to 30 percent of its U.S. sales by 2025. LOS ANGELES -- Audi envisions the potential of just one diesel model in its U.S. product mix in the wake of diesel emissions violations that have embroiled its parent company Volkswagen Group, Audi's U.S. head said on Wednesday. "Once we hopefully get past everything, I see an opportunity for potentially, probably to offer it on one model, and that model would probably be the Q7 SUV," Audi of America President Scott Keogh told Reuters at the Los Angeles auto show. "It's the one model that makes the most sense." At its height, diesel made up seven percent of Audi's U.S. sales mix, said Keogh, who added it was "always a bridge technology" before emissions standards were to get progressively tighter. Keogh said the future for Audi was electric, with battery electric vehicles projected to make up 25 percent to 30 percent of its sales mix by 2025. The brand plans to launch its first electric SUV in 2018. Volkswagen of America's CEO, Hinrich Woebcken, told the AutoMobilityLA auto dealers conference on Tuesday that diesel would never reach the 25 percent of Volkswagen sales it once enjoyed in the U.S.
"Our prediction is that we will not come back with diesel in the same magnitude we had before," Woebcken said.